The depth and depravity of an author's imagination can be nothing short of blood-curdling. Over the years, crime writers have conjured up all manner of evil-doers (who is more terrifying than the fictional monster Hannibal Lecter? ), all kinds of insoluble plots (did you solve Agatha Christie's And Then There Were None?) and psychological thrillers that confound most people's imaginations (the recent novels Gone Girl and Defending Jacob spring to mind). But sometimes authors have to take a step back and apply the brakes. As much as we like our minds to run wild, we know that our readers won't swallow every outrageous story line we throw at them. We have to balance the plot, the characters, the twists, to keep the suspension of disbelief, well, believable. Can you imagine watching Batman swoop down to help Clarice Starling catch Dr. Lecter? No, that wouldn't do at all. So while our books allow readers to escape from reality into a place that's both dark and safe, we can't stretch and distort the worlds we create so far that there is internal dissonance. Reality, on the other hand, doesn't have to worry about that. Over the years, some crimes have been committed, some mysteries materialized, that no self-respecting author would ever create for fear of his book being tossed across the room to the sound of the reader yelling, "Oh, come on! That's just too unbelievable." Other real-life mysteries exhibit hackneyed tropes that crime writers abandoned long ago. But that's the beauty of a true-crime story - the cold, calculating, and murderous who live amongst us don't care a jot for what we think. Their bloody business is their own and if we want to read about it, well then, the weirder the better, and no holds barred. Mark Pryor is the author of The Bookseller [Seventh Street Books, $15.95]. This mystery has it all: an unidentified body, an unknown cause of death, and a trail of clues leading... nowhere. On December 1, 1948, a man was found dead on Somerton beach, in Australia. He was in peak physical condition (apart from being dead) but police couldn’t ID him: no papers and all the labels had been removed from his clothes. At autopsy, poison was suspected but not confirmed. 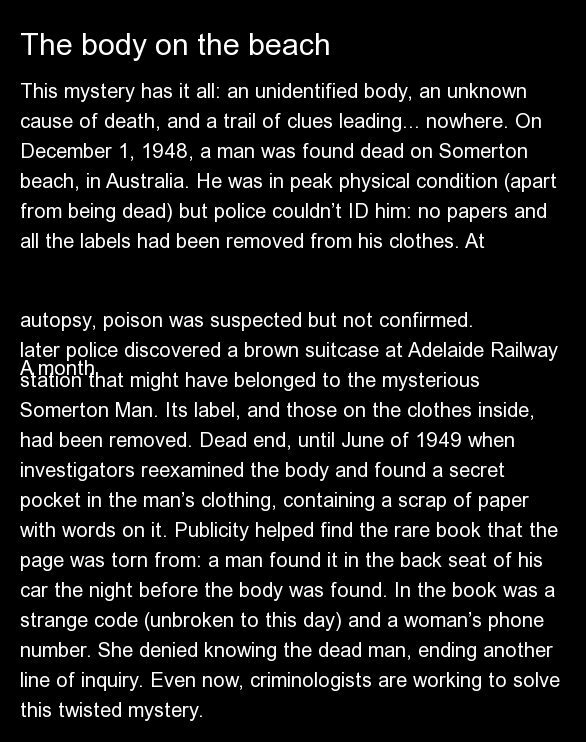 A month later police discovered a brown suitcase at Adelaide Railway station that might have belonged to the mysterious Somerton Man. Its label, and those on the clothes inside, had been removed. Dead end, until June of 1949 when investigators reexamined the body and found a secret pocket in the man’s clothing, containing a scrap of paper with words on it. Publicity helped find the rare book that the page was torn from: a man found it in the back seat of his car the night before the body was found. In the book was a strange code (unbroken to this day) and a woman’s phone number. She denied knowing the dead man, ending another line of inquiry. Even now, criminologists are working to solve this twisted mystery.